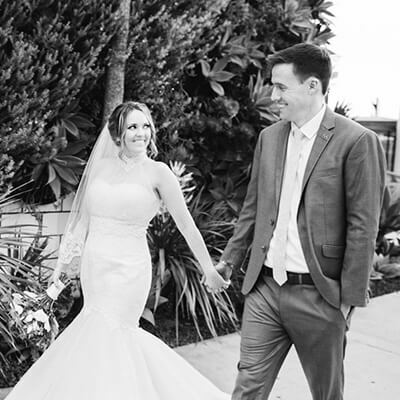 When searching for your perfect Southern California wedding venue, you are bound to come across the city of Temecula and some of the amazing Temecula wedding venues. Known for its beautiful wine country and quaint old town, it is basically the Napa Valley of Southern California – how awesome is that? With forty-plus wineries, the options are endless. You could be touring venues for months on end! If you find Temecula an intriguing possibility for your big day but you are looking for somewhere other than a winery, we are here to help. There are a vast variety of Temecula wedding venues that aren’t wineries that still have the same gorgeous views you would get at one. Many do not know what Temecula has to offer with its breathtaking hills and farmlands. We are going to break down some of the coolest places the city has to offer. This venue is the perfect setting for a rustic, modern, or bohemian wedding. The beautiful Retro Ranch is nestled off of Pala Road, and the owners pride themselves on creating a lasting relationship with their couples. Upon booking at the Retro Ranch, couples are given complimentary use of the site for an engagement shoot. Think about the money you’ll save with that great incentive! With so many hidden nooks and crannies, the photos are sure to be gorgeous. After saying their “I do’s” at the altar, couples can carve their initials on the Rustic Arbor to forever leave their mark. 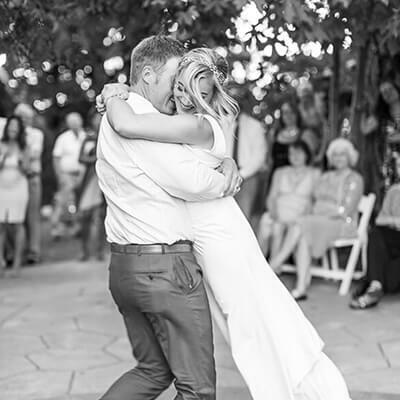 Your relationship with Retro Ranch doesn’t stop after your wedding day – on your one-year anniversary, couples will be invited back to celebrate. You will receive an adorable picnic basket filled with goodies such as cheeses, crackers, fruit, and champagne. It’s the perfect day-date while you enjoy the beautiful scenery at the ranch. As one of our favorite wedding venues in Temecula, the Retro Ranch offers an extremely lovely and intimate ceremony site nestled in the oak tree mountains. 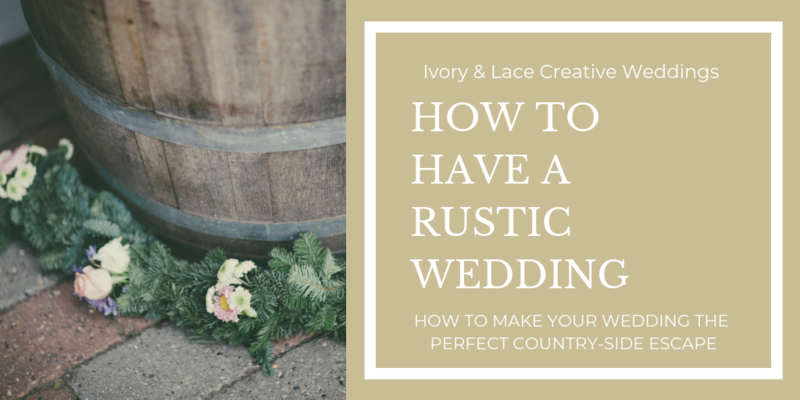 Walk down the aisle after entering through French doors and say your vows under a rustic wooden arbor. The Arbor is completely customizable, and the seating arrangements can be mixed up, as well. After the ceremony, your guests will feel extra cozy at the cocktail courtyard that sits underneath mimosa trees. The area features wine barrel cocktail tables, vintage furniture and seating, and the coolest Malm fireplace. Everything is topped off with vintage strung café lights creating the perfect ambiance. After cocktail hour, everyone can get their groove on under café strung lights and vintage crystal chandeliers or grab a signature cocktail at the handmade wood pallet bar. 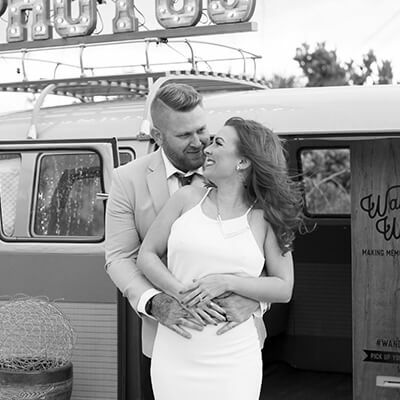 The venue’s 1968 Airstream makes for the perfect photo backdrop. What’s more, the Retro Ranch offers a variety of lodging areas for out-of-town guests or even your honeymoon suite. The best part about this Temecula wedding venue? The owners have made it their mission to “give back,” so every couple that walks down the aisle gets to pick a charity of their choice to which some of their proceeds will be donated. Yet another gorgeous ranch is next up on our list of Temecula wedding venues. The Blue Moon is the perfect spot for a variety of different wedding themes and a little touch of rustic flare. This Temecula wedding venue allows for endless customization when it comes to decor. 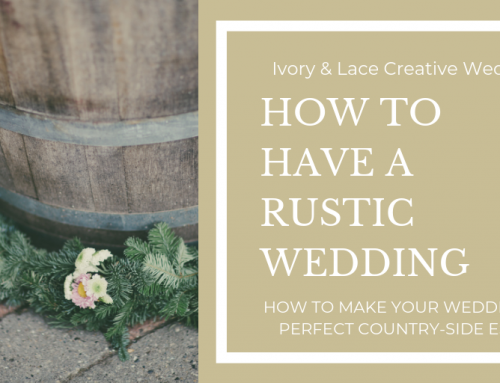 It would be great for DIY brides or those that want a unique theme that truly shows their personality as a couple. You will fall in love with this dreamy space and its scenic views. The ranch has multiple barns to utilize for a reception space, ceremony backdrop, and the perfect photo op. 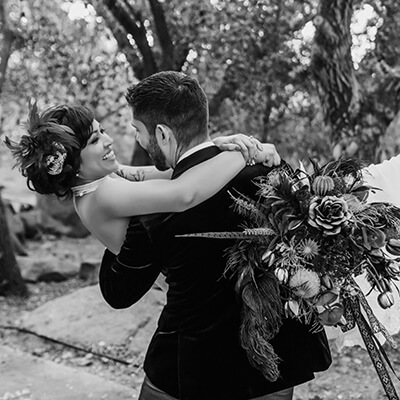 As the second one of our favorite Temecula wedding venues, the Blue Moon Ranch offers four different wedding packages for couples to choose from and to meet their budget needs. 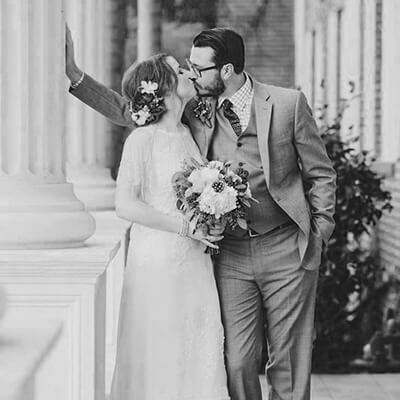 Their most exclusive and expensive package accommodates up to 150 people while including the ceremony, reception, and backyard cocktail spaces; ranch tables and chairs; the cutest private bridal quarters; a bartender and bar set up; assisted valet parking (bonus! ); and linens. Just take a look at this vintage 70’s inspired wedding held there and you are sure to fall in love! With a name like that, how could this space not be amazing? It is perfect for those eclectic indie weddings. Just look them up and you will find tons of weddings held at this magnificent Temecula wedding venue. It’s always a crowd pleaser. The venue’s grounds and views are seriously unreal. There is one thing to know about this space, however, before you go researching it online – you won’t find much. 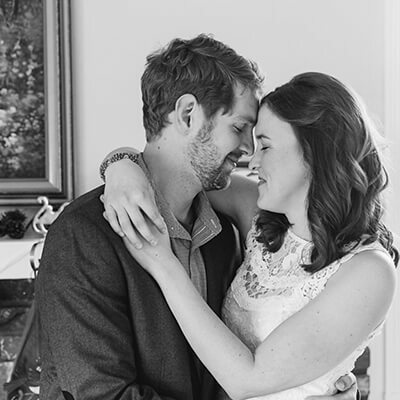 Wolf Feather Honey Farm likes to keep a sense of secretiveness and exclusivity with their venue. On their site, you will find they have no photos of the space. 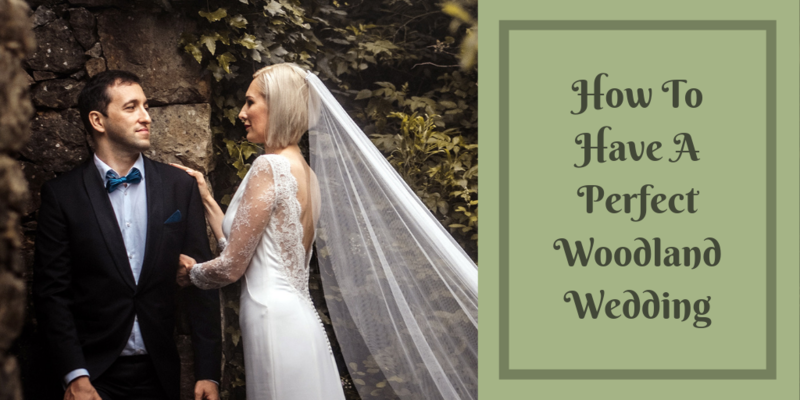 This may seem like a downfall and be a turn off for you while venue hunting, but they want couples to make the effort to come to see the space for themselves. 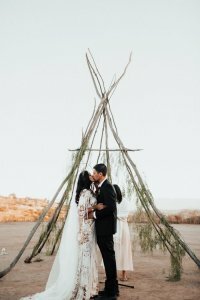 The one thing we know for sure is that they have the most rad teepee ceremony site for those edgy couples. They purposely make it hard to find them, which only makes it that much more magical once you do. Looking for a quaint and intimate setting to celebrate your big day with your family and friends? Two Sisters Farm is the perfect place for you. 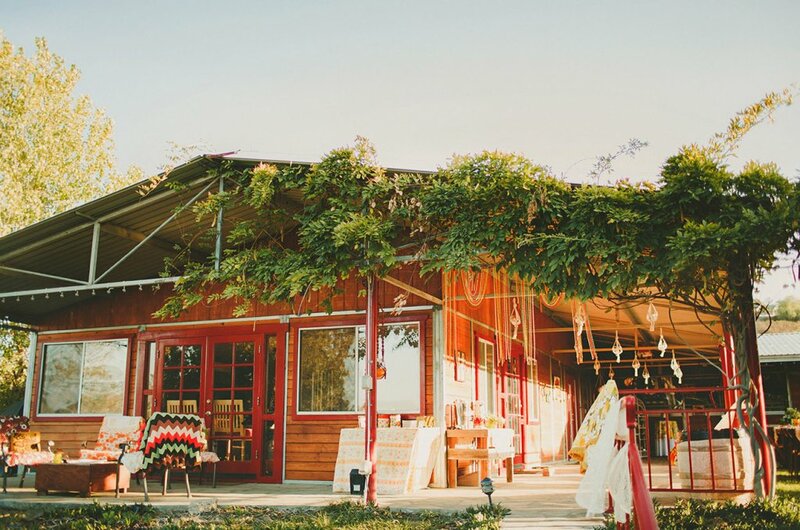 Nestled in wine country, this farm was started by two daydreaming sisters who wished only of living close together and their husbands who dreamt of farm life. We love a great family-oriented venue! 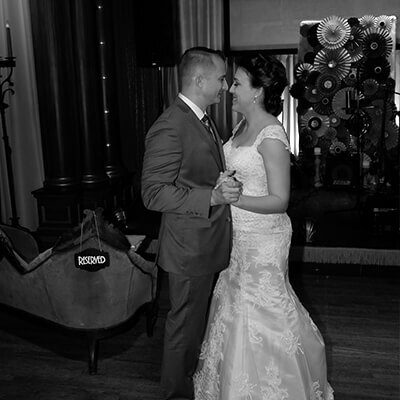 Couples can be sure that they will receive the best service and the most personal experience. This farm has beautiful views of meadows and fields. 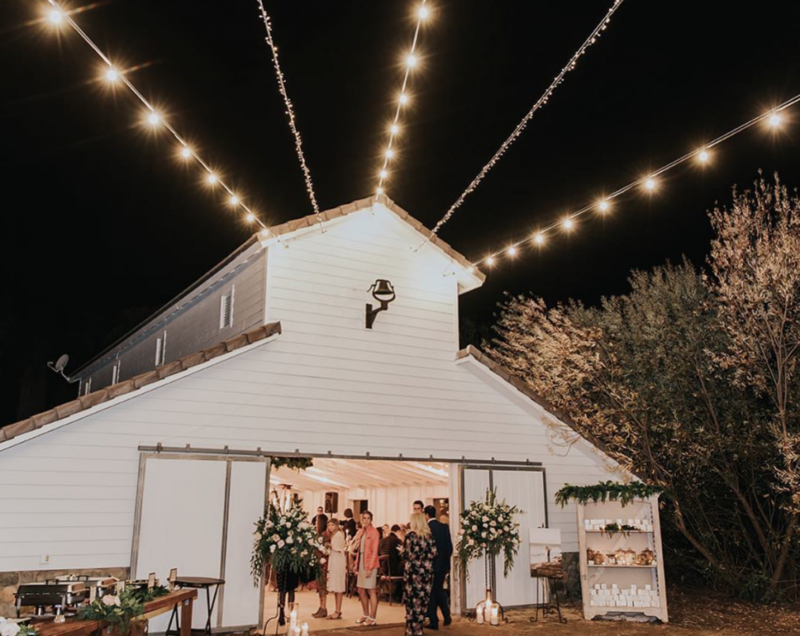 Its charming barn – featuring café style strung lighting – will make for the perfect backdrop for your ceremony or sweetheart table. Turn this space into your own desert oasis or use its rustic feel to create a Western vibe. The decor options are endless and completely customizable; that is something we love about these Temecula ranch venues and farms. Two Sisters Farm features white horse fences and cascading pepper trees. Talk about a romantic setting! 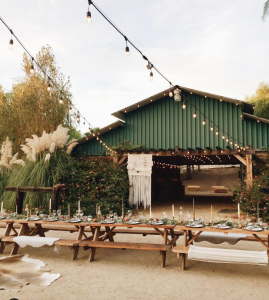 The last entry on our list of Temecula wedding venues is Winter White Barn, which is a new addition to the Temecula venue scene. 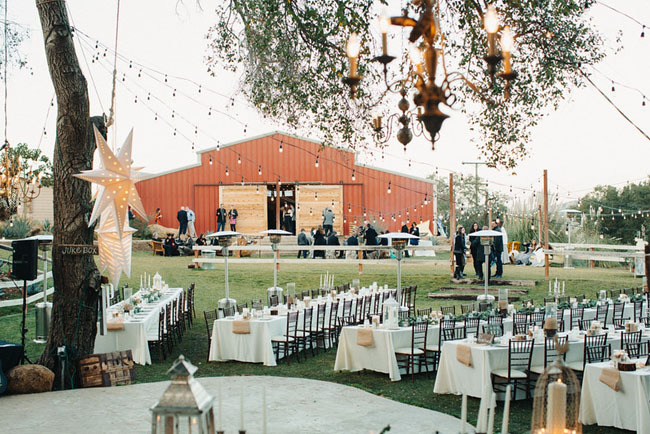 This spot is a lovely white barn nestled in Temecula’s wine country, featuring a very romantic setting where you’ll be surrounded by oak and pepper trees. The barn features a pre-ceremony gathering area, a ceremony area, and a fully furnished cocktail space. 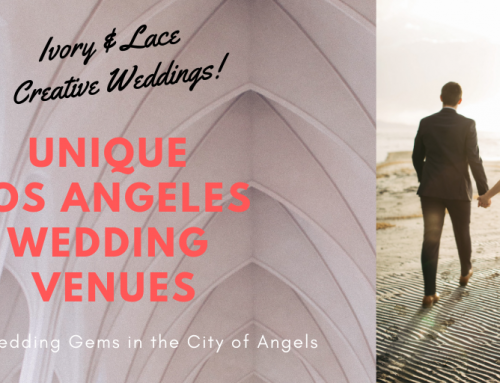 You’ll love this venue and all the beauty that comes with it! There’s no need to stress about a ton of decor, because Winter White has strung designer lights and the prettiest furniture. The owner of the space put her heart and soul into designing the most dreamy space for couples to start their lives together. The all-white exterior gives off a clean elegance that will take any couple’s breath away! Through its wonderful design, this space would be great for a modern wedding. We hope that you feel inspired and ready to tackle your venue search in beautiful Temecula. 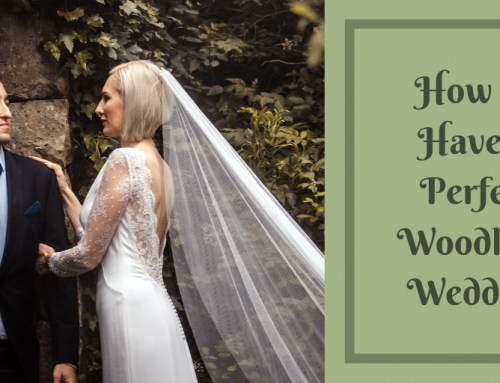 Venue hunting can be a stressful task, especially when there are so many to choose from. 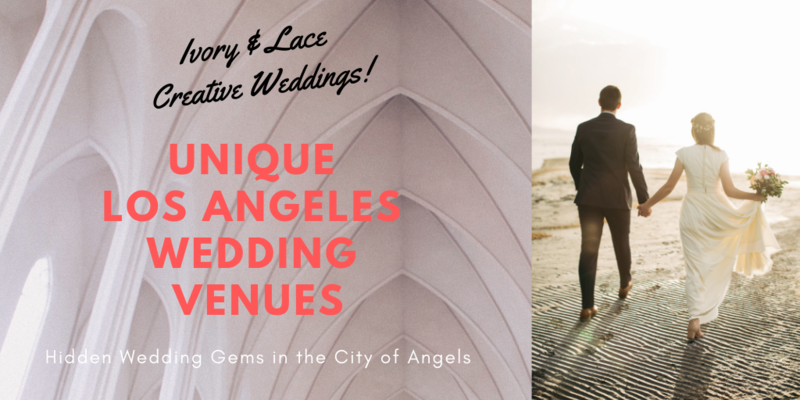 All of these rustically inspired venues featuring barns, farms, and much more are ready to be transformed into your fairytale wedding that you will remember for years to come!